The scenic drive takes people from one entrance to the other. There are loops along the way at various points, as well as turnoffs for camping. Desert View was the first stop from the way we entered and from there, we stopped at Lipan Point. 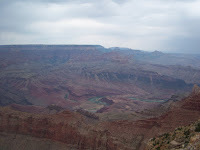 It's the widest point at the Grand Canyon and Fodor's says you can see every eroded layer there. It was my favorite part of the drive, as it was the first place I could really see the Colorado snaking its way deeper into the earth. 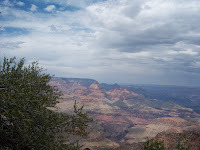 We didn't spend a lot of time at Lipan Point. We were starting to get hungry and hopeful. 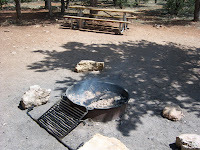 There are campgrounds inside the Grand Canyon National Forest. We didn't expect to find a place to camp for the night, but it was a possibility and that's all we needed for a little excitement. We skipped Moran Point, for no other reason than the fact that the next stop was the Buggeln Picnic area. 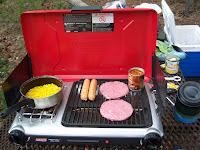 We quickly set up shop with the grill, burgers, brats, beans, and corn. We're not allowed to grill at home because of fire dangers and apartment regulations. So grilled food was an extra treat. We weren't as organized as I would have liked. Our food, pots, utensils, and condiments were scattered between a cooler and several bags. 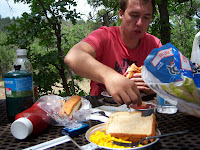 We didn't have proper grilling or eating gear for camping. There's a lot of room for improvement in that department, and I took a lot of notes. Still, even with the drawbacks, everything was delicious and we were still able to thumb our noses at the cold sandwich saps. We savored but didn't dawdle. We still had the flickering hope we'd be able to camp there and wanted to get to the campgrounds. We didn't want to miss the sites though, for a slim chance. So we decided to stop at a few more points along the way to the campground. We had no excuse for missed opportunities. Grandview Point was next. I think (like the Grand Canyon) the name is weak. It appears to just be something that stuck. Pete Berry built a hotel at this site in 1898. He called it "Grandview" and brought tourists in my stagecoach. It was the most popular tourist destination along the canyon until 1901, when the Santa Fe railroad reached Grand Canyon Village. I took pictures of the view, and of Jesse as he walked too close to the edge in his not too trusty flip flops. And then we set out for the moment of truth. The turnoff to the campground led us through a lot of slow moving traffic. We knew we had arrived when the sign directing us too the grounds had another sign attached, declaring "full." It was kind of what we expected (as it was the 4th of July) but it was still disappointing. We decided to drive through the campgrounds anyway to see how they were set up. We noticed a lot of empty spots. The set up seemed efficient - parking spots out front, boulders protecting the campground, fire pits, and picnic tables. We also noticed a lot of empty spots, and decided to check in with the front office. There were two signs on the window. One (again) explained the camp was full. The other explained the reservations system, and therefore why the empty spaces were not available. We started to walk away when the man in the office called out to us: "Can I help you?" "I have one site. It just opened. A girl left early. I told her it wouldn't take me ten minutes to fill it and it hasn't been ten minutes. You want it?" And that's how we got to camp at the Grand Canyon without reservations over 4th of July weekend. Life was great and our site was even better. It didn't have a lot of parking space, but I don't have a lot of vehicle. The site itself was more than big enough. And (as a testament to the man behind the window) the log in the fire pit was still smoking. There were a lot of trees and therefore a lot of shade. It was everything I envisioned when I envisioned "camping." We were giddy with success. We set up camp quickly and set out to get outfitted. my heart was pounding, i was hoping the man would say there was room. that is always what i say, "you never know until you ask," i was so happy you got a spot. what a great ending.